In the ER, someone accidentally bumps into an aide carrying a bedpan. Urine sloshes onto the floor. I watch unwitting people step in it and track it all around the ward for about twenty minutes before the environmental team comes to clean it up. Hours later, my mother is admitted and I pay for her TV, but she does not have the strength to push the buttons. She can’t find the red button to call the nurse either. She tells me that last night, nurses took her down to a dungeon where she lay awake in terror. Now she wonders why they have left a black, scotch terrier in the corner of her room. Despite the fact that I gave the doctor a detailed print out of all her medications, doses and times, no one bothered to give her the pill that prevents such hallucinations and fear. My mother is in the hospital because unrelenting nausea has left her unable to eat or drink. The dementia comes from her Parkinsons, or from the medications that help her to walk. Or both. Eventually I have to go home. My son, a high school junior, is in the midst of getting ready for midterm exams. Did he really need to go get a haircut today? I imagine college admission officers looking over his shoulder, frowning. He needs a motherly nudge. He wants me to look over his essay on Macbeth. The nudge is probably more my need than his. And I need to make phone calls, cancel a few meetings, ask our seminary intern to take over some other hospital visits. I tell my mother that I have to leave now. She’s trying to hold back tears and tells me how afraid she is of being alone. The tuna fish sandwich that she couldn’t eat is now making me feel sick. Or maybe it’s sandwich generation guilt, rising like bile. I’m reading the opening paragraph of “How Macbeth Lost Himself” when the phone rings. It’s my mother calling to tell me that they have taken all the furniture out of her room and she has no bed. And so we come, to join the disciples on their trip up the mountain with Jesus. They must be exhausted by the non-stop demands of the crowds seeking the attention of Jesus. Soon they are sent off with power and authority into the same needy crowds to cure, proclaim and heal. They have an enviable run of success and return to tell Jesus all about it. But when he takes them to “withdraw privately” for a well-earned rest, they are interrupted by more crowds and the work of ministry continues. It’s been a long day and enough is enough. The weary disciples beg Jesus to send the crowd away. But we know what happens next– fish sandwiches for five thousand, or more like 15,000, counting the women and children. When they finally do get a day off, it doesn’t feel much like a vacation with Jesus telling them about his upcoming suffering, “great suffering” actually, rejection, death (treatment they might expect as well) and on the third day, rising. I don’t blame them for missing the rising part. When you think you’re heading for the dungeon, anxiety and panic tend to block out everything else. Eight days later, they are still reeling, in no shape for mountain climbing, even if it is to pray. Luke is the only one who mentions prayer as the reason for their mountain ascent. Why can’t they just pray where they are? But if I am honest, some days, many days, the attempt to pray is a steep, uphill climb on weary legs. And if I make it, it’s only thanks to the company I keep– Jesus, Peter, James and John– Jesus and the communion of saints, past and present. Our fellow travelers make it up, but Jesus appears to be doing all the praying. His followers can hardly keep their eyes open, another detail unique to Luke’s account, connecting the mountain of transfiguration and the Mount of Olives, unlikely twin sites of glory’s face and backside. But here, sleep does not overcome the three. They are startled by a flash of radiance. Jesus, who must have reached the summit as sweaty and dusty as they did, now shines with the light of heaven itself. The rough fabric of his clothing shimmers like a swath of sunstruck water. The disciples behold the glory of God. They see two men as well. Only Luke mentions the two men, as he likewise mentions two men in dazzling clothes at the tomb– messengers of glory at the brink of death. Here the two men are introduced as Moses and Elijah: They appeared in glory and were speaking of his departure which he was about to accomplish in Jerusalem. The word translated as “departure,” comes from the Greek word for exodus, referring not only to the trip down the mountain and into Jerusalem, but to Jesus’ death. Moses’ presence makes the connection unavoidable; now Jesus will accomplish a second exodus, leading people safely through the waters of death, even as his own flesh is parted in waves of pain on the cross. But this talk of exodus and death in the midst of transfiguration is lost on the disciples with sleepers and stardust in their eyes. Peter gives voice to the confusion of his stunned companions, suggesting that they arrange to stay up on the mountain top. Unlike Peter, I have found the mountain top of this text a less comfortable place, perhaps because, unlike Peter, I have not been there. Each year, when this story comes up, I am eager to move away from mountain top to more familiar terrain. I feel more at home when they get down to the needy crowd. More at home with the parent who is desperate for the welfare of their child. More at home beside the disciples who now are powerless to effect a cure. 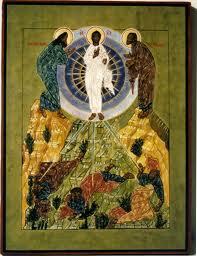 All the transfigurations I’ve seen, and I have been blessed to see them, have been down below. There, I have seen lives transfigured, demons cast out, children raised up. These are the transformations for which we work and pray and hope, the transfigurations that brighten our days with wonder and joy. But there are other days. We all have them. This year, I’m less eager to rush down to the bottom of the hill. I’d like to linger in the story up on the mountain. I’d like to listen to the voice that interrupts Peter and brings balm in the midst of fear: “Listen to him,” we are told. Listen for dear life. Listen to words of forgiveness, mercy, promises of paradise, words from the cross. Listen without ceasing, on the edge of glory and the brink of death. I beg you to look at my son, a father cries out, echoing another voice: Here is my only begotten son with whom I am well pleased, listen to him. Listen on this hill and on another where darkness closed in.